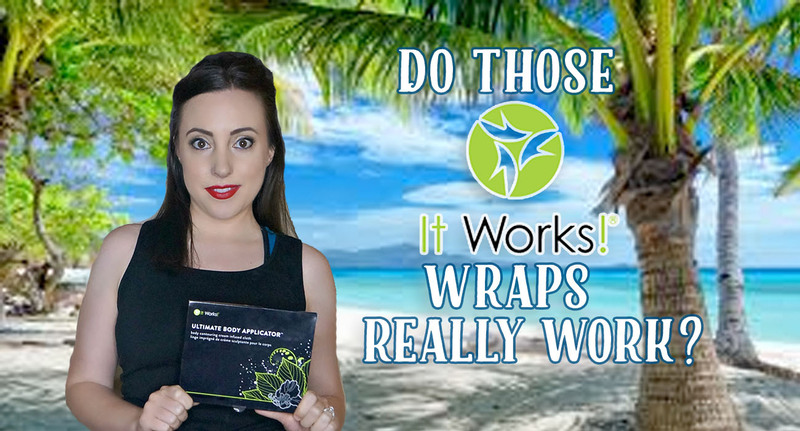 Do It Works Wraps REALLY Work? Here’s What I Found Out! By now, I know you’ve heard about “those Crazy Wrap Things” sold by the networking marketing company, It Works. Ever since I had my first baby four years ago, It Works distributors have been reaching out to me on Instagram. It seems that lately there are SO many distributors working for It Works and that got me thinking. All of these people are claiming the product works and it’s so popular that despite the competition, many distributor are doing quite well…..I wonder if it really works? Note: This blog post is sponsored by Aviva, an independent distributor of It Works. I received two complimentary products to facilitate my review. All thoughts presented are my own. I am not a distributor, simply just a mama who wanted to try something everyone was talking about because I was curious and I’m sharing my experience with you! Recently, I was contact by Aviva, an It Works distributor in Canada who loves to travel and has quite the impressive Passport to prove it! Unlike other distributors who contact me with promotions, Aviva seemed to really care about getting to know people and helping them. (Keep in mind I’m the kind of person who is always a bit skeptical, so I have to try certain products before I will purchase them.) As we began talking about things, she believed in the product SO much that she said I could try it and see for myself…. and so I did! I received two products to try: one Ultimate Body Applicator wrap (a body contouring cream infused cloth) and some of the Greens on the Go (individual packets of drink mix- Berry Flavor). How do the Wraps Work? Choose the area where you will apply the wrap to your body. Open the pouch and unfold the wrap. Apply the lotion side of the wrap to your skin. Smooth out the wrap across your skin. Secure it in place with plastic wrap or form-fitting clothing. Remove the wrap and throw it away. Rub remaining lotion into your skin. It Works recommends that you use one wrap ever 72 hours and Aviva said you will likely need to use 3-4 wraps to get the desired results. Knowing that, I didn’t expect an extreme makeover with just one, but it was at least enough for me to try and see if it did anything. Why would I try something like this? I chose to apply the wrap to my stomach for obvious reasons. Mom of two, definitely a problem area. I’m already short as it is (5’1″) and when I got pregnant with Andrew I was a size 0 and weighed only 105. I gained a ton of weight (weighing in at 154 the day I had him). I went 39 weeks without a single stretch mark, but as luck would have it, he takes after his mama and was almost a week late. That last week I looked like I was attacked by a bear! It took almost a year to lose it. I ended up losing all but 5 pounds. At Andrew’s first birthday, I was already 3 months pregnant with Aidan. I made healthier eating choices, but having them so close together was not easy on my body at all. I weighed 156 the day Aidan was born (5 days early, another induction) and at this point, it was hard to determine which stretch marks came from which pregnancy. All I knew is my tiny frame had grown very big. Twice. And my stomach will likely never be the same again. As you can see, I definitely gained most of the weight in my stomach! I know people who have babies and then a week later are already bikini ready. Every woman, body, and pregnancy is different. I’m certainly not one to bounce back right away. To be honest, I am still waiting to bounce back and Aidan just turned 2. I almost lost all of my pregnancy weight but this year has brought new challenges, stresses, less sleep and some struggles with healthy eating so I’m definitely not where I want to be. I do know, however, how to lose weight and it’s not that hard as long as I work to maintain a low-carb diet. (Carbs are my weakness!). However, even at the point where I almost lost all of the weight, my stomach is NO WHERE near where I would like it to be. Along with the stretch marks is extra skin. And I’ve seen some amazing results with these It Works Wraps Before & After shots, so I thought, why not? Let me try this for myself and for all the other mamas out there who are curious. Let me put myself out there and see what this is all about. And so I did, with Aviva’s help, of course! First Impression & What was it like? Before & After: Did it Work? Now here’s the crazy part. In order for me to really let you know how this works, I have to totally put myself out there, in a different zip code–probably a different PLANET–away from my comfort zone. I purposely choose to wear a once piece swimsuit these days. I also wear clothes. And you will NEVER catch me in a crop top. But you know what, I’m no longer in my 20’s. I’m a mom. My body has worked VERY hard to produce not one but TWO AMAZING boys and I’m very proud of that! As a mom in my 30’s, I find it SO much easier to just be real with myself and others. So I’m going to step outside of my comfort zone and share the brutally honest truth, which, consequently, will be accompanied by some unattractive photos. If you’ve never seen what a short mom’s stomach looks like after carrying two babies, this is probably the part where you’ll want to look away. Seriously, especially if you are eating. You have been warned. Yep. Motherhood is not for the faint of heart! But it is SO worth it! Okay, so again keeping in mind that Aviva told me it takes FOUR Wraps to see complete results, and It Works saying that there should be 72 hours between wraps, I wasn’t expecting a miracle. But… I really believe that I SAW RESULTS! I’m actually quite impressed at the difference in my skin with just 25% completion of the entire process. I feel very confident that if I continue eating well, start working out, and do a full treatment of wraps I could actually look close to my pre-pregnancy self. It’s really interesting how it all works and I will have to see if I notice any changes over the next few days. I’ll continue to drink a lot of water-I should be doing that anyway! Note: Don’t mind my random belly button birthmark. Also, the red line on my side in the After picture is just from the plastic wrap. It went away! And yes, I need to lose 15 pounds. So-Do It Works Wraps REALLY Work? As a mom who definitely has a need for this product, and after experiencing REAL results myself, I’m going to say YES! And I think I’m going to try to lose the last 15 pounds back and do the full set of wraps. I’m convinced this product really does work-hence their name! So next time a distributor contacts you, just know that this product is Mom Tested and Mom Approved by ME! If you’re interested in trying it- I’ve left Aviva’s contact information before with links to her shop. She will take great care of you! Now, that we’ve covered the products, I want you to meet Aviva, the distributor who was kind enough to help me with the new product line. She’s awesome and has a great story. I personally think building relationships and getting to know people and their stories is the best part! So I interviewed her and would love for you all to get to know her a little and learn about why she chose a career with It Works! Lindsay Satmary: When was It Works launched? Aviva Wittenberg: It Works started in 2001 and is a debt free company that is in over 17 countries world wide now. LS: How and why did you get started with It Works? AW: I started with It Works because I wanted a change in my career where I could be my own boss and earn the income I deserved. It was inexpensive to start ($99 usd), easy and it came with an unlimited amount of support from other distributors and mentors. LS: Who is the ideal It Works customer? AW: Anyone who wants to improve their life! We have products that can help with your health, energy levels, physical appearance such as hair, skin or body as well as your life style. Distributor options are also available on my team for people who want a change in their life style and career. LS: How many products are available for purchase? AW: We have over 30+ products available for a variety of needs. Whether you want more energy, lose some pounds, sleep better, grow longer hair or many other options we have a product for you! AW: I find a lot of my inspiration through the other amazing people that I work along side with. This company offers an unlimited amount of support, encouragement and inspiration from each other. I have never worked in an environment that is so positive and focuses so hard on my own success. It’s refreshing to know that I have an entire network of people around me helping me every day to achieve my goals. What’s playing on your ipod right now? AW: I absolutely love animals so one of the last books that I enjoyed reading was ‘The Elephant Whisperer’ by Lawrence Anthony. It’s a true story about rescue elephants on a reserve in Africa; great read! LS: What do you love most about It Works? AW: Aside from the amazing products I love that I am able to sell to customers and sign up distributors in over 17 countries worldwide. I’m an avid traveler and have visited around 25 countries so far in my life and with It Works I plan on visiting many more. I also love that all of It Works products are all natural as that’s very important to me. LS: What exciting plans for It Work’s future can you share with us? AW: It Works is always growing and expanding and I’m excited for them to add even more countries to our list. Austria was added this year and I can’t wait to find out who’s next. AW: I know that I could say someone famous or political but my true choice would be my boyfriend. I’ve been in a long distance relationship for years with my wonderful boyfriend who’s in another country, so if I could have lunch with him I would be very happy. LS: What is something you’ve learned so far while working for It Works? AW: To dream big! This company teaches you that your dreams are always attainable so dream big and make them happen. Aw: I have a lot of places on my bucket list that I’ve yet to see, I think the next place I would like to go would be a safari in South Africa. I much prefer to see animals in their natural habitat than the zoo and what better place to see this?! LS: Entrepreneurs and MLM operaters often work long hours. How do you enjoy spending your time off to recharge? AW: That’s actually one thing I love about working for myself with an MLM company: I can work whenever, wherever I want. I’m not chained to a desk all day and I can work from my phone anywhere I am. However, when I do finally put down my phone I like to go hiking or binge watch Netflix. LS: What’s your goal for your next milestone with your It Works career? AW: To introduce more people into this amazing career and life style so that they can achieve their goals as well. LS: How has working for It Works changed your life? AW: It’s given me the freedom to own my own time, earn the income I deserve, be my own boss and has allowed me to travel more. LS: What message would you share with those interested in pursuing this opportunity with you? AW: I would let others know that ‘you only regret the opportunities you don’t take’. This business is $99usd to start and can change your whole life. You can travel the world or stay at home with your kids- you can reshape your life. You will have an endless amount of support and dedicated people around you to help you succeed and I will be there throughout your entire journey to help. If you’re looking for a change in your life for the better or even if you just want to add something else to your already amazing life then this could be the opportunity you’ve been looking for. We have people from all walks of life in this business; nurses, stay at home moms, teachers, hairstylists, husband and wife teams- you don’t have to come from a sales background to succeed with It Works. LS: What can you tell me about the benefits of It Works? AW: There are too many benefits to count. From absolutely amazing products that can enhance your life to becoming a distributor and designing your perfect life, It Works can benefit you in so many ways. LS: Which It Works products are YOUR personal favorites? AW: My personal favorite products are Hair Skin & Nails and also the greens. After bleaching my hair blond for so many years I could grow my hair past my shoulders and it was dry and always splitting. After being on HSN for our 90 day challenge my hair has grown about 5 inches, is softer, shinier and thicker. My eyelashes also grew super long, as well as my nails and my skin feels great too. Our Greens are also my favorite because every greens I’ve ever tried always tasted chalky and just plain gross. Ours have a smooth texture, actually taste amazing, provide 8+ servings of fruits and veggies and give you an extra burst of energy (which I always need). LS: Which It Works products are your most popular? AW: Our wraps our are most popular product because their made from an all natural botanical cream and tone, tighten and firm in just 45 minutes. Like my two favorites as well, our Hair Skin & Nails and Greens are very popular too. LS: What are you most looking forward to this summer? AW: Enjoying the summer sunshine with my friends and families. Hiking adventures, fun at the lake and of course helping new customers achieve their goals. LS: What tips and tricks can you share to help ItWorks customers get the most from their products? AW: When you go to the gym, you don’t completely change after just one time right? The same goes with our products, we host 90 day challenges for a reason. Don’t give up, results take time and once you finish your challenge I know you’ll love what you see. WEBSITE: AVIVA’S DISTRIBUTOR WEBSITE -US CUSTOMERS WELCOME! All customers that sign up as a loyal customer for 3 months will receive any product they want at 40% off. This promotion will last for life once their 3 month auto ship is completed. CONNECT WITH AVIVA ON FACEBOOK, INSTAGRAM, & PINTEREST! Have YOU tried It Works yet? Next post Waffle Love: AKA BEST Waffles EVER!